Evgenia Obraztsova and Denis Rodkin in The Talisman pas de deux, music by Riccardo Drigo, choreography by Marius Petipa. Benois de la Danse 2015 laureates Gala concert. Shot on 26th of May 2015 in The Bolshoi Theatre, Moscow. Evgenia Obraztsova (Rus. Евгения Образцова) is Principal with the Bolshoi Ballet Moscow. She was born in Leningrad (St. Petersburg) 1984 to a family of ballet dancers. Obraztsova graduated from Vaganova Academy of Russian Ballet, St. Petersburg, Marina Vasilieva’s class (trained also by Lyudmila Sofronova and Inna Zubkovskaya), in 2002, and joined the Mariinsky Ballet Company the same year. Since 2010, Evgenia Obraztsova has been guest soloist with Stanislavsky and Nemirovich-Danchenko Moscow Music Theatre. In 2012, she joined Bolshoi Ballet. She is coached by Nadezhda Gracheva. She has won several awards, including the Gold Medal at the Moscow International Ballet Competition in 2005. Also an actress, she portrayed a ballerina in the 2005 film The Russian Dolls, and was one of the ballerinas profiled in the 2006 documentary Ballerina. 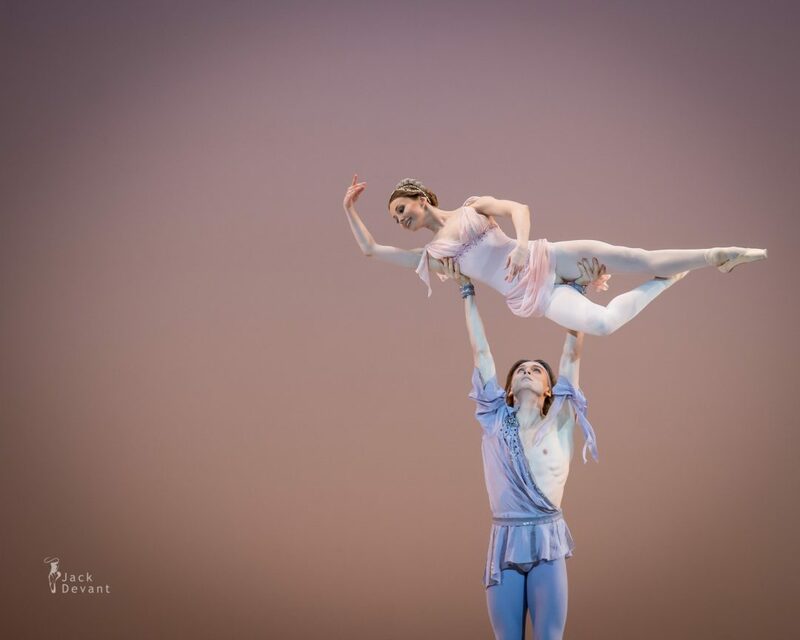 The Talisman (AKA Le Talisman or Il Talismano) – Fantastic ballet in 4 Acts-7 Scenes, with choreography by Marius Petipa, and music by Riccardo Drigo. Libretto by Konstantin Augustovich Tarnovsky and Marius Petipa. It was premièred 1889 at the Imperial Mariinsky Theatre in St. Petersburg, Russia This ballet gave rise to the so-called Talisman Pas de Deux, which is today danced by many ballet companies. 5 Responses to "Evgenia Obraztsova and Denis Rodkin in The Talisman pas de deux"
I`m a big fan of Evgenia Obraztsova. I discovered her back a few years ago on You Tube and finally saw her in person on Thursday June 18,2015 in New York in Romeo and Juliet with American Ballet Theater. I`ve seen almost every video of Ms.Obraztsova on You Tub: however there is one ballet that I`ve never ever seen and that is Talisman. I just saw those beautiful photos of Ms.Obraztsova. I even sent her an email requesting a video of Evgenia dancing in this ballet Talisman to upload or download for You Tube. This is the only ballet that I have never eve seen danced before but have only seen the photos of. Would love to see Talisman on You Tube. Thankyou very much if you can find this ballet for You Tube with my very favorite ballerina Evgenia Obraztsova. Terry, it’s not that simple. Theatres and promoters sometimes restrict what can be uploaded on YouTube. Recently the two largest ones have clamped down on audience filming, allegedly due to copyright but there are other reasons. In the rest of the world, it has never been possible for audience to to film during performances, only in Russia. You just have to keep looking and maybe one day you might be lucky and see it appear somewhere. Often the artist themselves is later allowed to release excerpts. Jack, these photos are exquisite! There are rarely bad photos of Genia from anyone, due to her superior positioning, but for me you capture the very essence of their dancing personas besides their technique and beauty. Thank you so much for the Facebook link and for this beautiful page. Thanks for your beautiful words. Just wanted to enlighten you , that even shooting as great as Obraztsova, I still have to pick very carefully THE best photos to show her at the best.